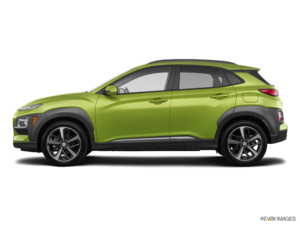 This crossover is the result of Hyundai attempting to break into the mini-SUV market and will compete against vehicles like the Kia Soul, the Jeep Renegade, and the Mazda CX-3. Hyundai is releasing a brand new model this year that is sure to turn heads: the 2018 Hyundai Kona. This crossover is the result of Hyundai attempting to break into the mini-SUV market and will compete against vehicles like the Kia Soul, the Jeep Renegade, and the Mazda CX-3. Loaded with features, the 2018 Kona is sure to make an incredible debut. The Kona reaches just 4.18 meters in length, which means it is significantly shorter than its competitors. It may be small, but it still boasts over half a cubic meter of cargo room. The entry-level model of the Kona will feature a 147-hp, 2.0-litre four-cylinder engine with a six-speed automatic transmission. An upgrade is available for those seeking more power: a 175-hp, 1.6-litre turbocharged four-cylinder engine is an option on the Limited and Ultimate trims. This turbocharged engine is paired with a dual-clutch, seven-speed automatic transmission. Regardless of a buyer's choice in engine, the Kona is available with either front- or all-wheel drive. This may mean a reduction in fuel economy, but the drivetrain option is sure to be a winner with potential customers. While the interior certainly isn't anything that has not been seen before, its simplicity lends itself to convenience and safety. Android Auto and Apple CarPlay compatibility are standard on all trims of the Kona, in addition to a moderately sized touchscreen. Other options for the interior include wireless phone charging, 4G connectivity, and HD radio. There are a number of great safety features available for the Kona. These features include rear cross-traffic warning, lane assist, high-beam assist, automatic emergency braking, and driver attention warning. The Kona will arrive on car lots early this year. For the best prices on this exciting new model contact us today.